It is notoriously difficult to create hardware that is immune from side channel and tampering attacks. A lot of recent literature, therefore, has instead considered algorithmic defenses from such attacks. In this paper, we show how to algorithmically secure any cryptographic functionality from continual split-state leakage and tampering attacks. A split-state attack on cryptographic hardware is one that targets separate parts of the hardware separately. Our construction does not require the hardware to have access to randomness. In contrast, prior work on protecting from continual combined leakage and tampering  required true randomness for each update. Our construction is in the common reference string (CRS) model; the CRS must be hard-wired into the device. 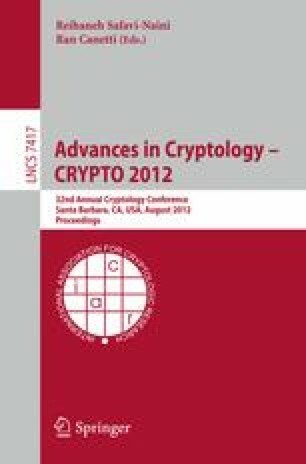 We note that prior negative results show that it is impossible to algorithmically secure a cryptographic functionality against a combination of arbitrary continual leakage and tampering attacks without true randomness; therefore restricting our attention to the split-state model is justified. Our construction is simple and modular, and relies on a new construction, in the CRS model, of non-malleable codes with respect to split-state tampering functions, which may be of independent interest.